Johnson Award goes to the most complete franchise, MacPhail Award honors promotional excellence. 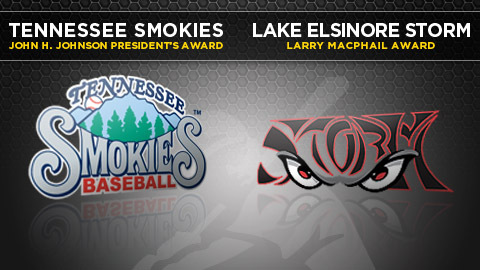 ST. PETERSBURG, Fla. -- Minor League Baseball announced today that the Tennessee Smokies and the Lake Elsinore Storm, respectively, are the winners of the John H. Johnson President's Award and the Larry MacPhail Award. The Smokies and Storm will receive their major awards at the Baseball Winter Meetings™ Annual Banquet on Thursday, Dec. 8, at the Hilton Anatole in Dallas, Texas. The President's Award, Minor League Baseball's top accolade, has been presented annually since 1974 to honor the complete baseball franchise -- based on franchise stability, contributions to league stability, contributions to baseball in the community, and promotion of the baseball industry. For the first time in its 38-year history, the John H. Johnson President's Award is going to a Southern League club. The Smokies are an original member of the modern day Southern League that was founded in 1964. Several staff members have been with the club for a decade or more, including general manager Brian Cox, who completed his 22nd year with the Smokies in 2011. The Double-A club celebrated 100 years of baseball in the Knoxville area this season, and also welcomed its 3-millionth fan since moving into Smokies Park in Sevierville, Tenn., in 2000. The club believes that if you want to relate to the community, you have to be involved in it. The Smokies are members of eight chambers of commerce and four lodging and hospitality associations. They also host community events, such as the Great Smoky Mountain Auto Fest and a Christmas Wonderland, at their ballpark throughout the year. The organization has also made a strong commitment to giving back to the East Tennessee community, as the club has partnered with many area schools, churches, youth and non-profit organizations. Through the Partners in Education program, the Smokies have adopted two area schools, and staff members and players volunteer time with projects and participate in school contests and functions. "For the Smokies to be recognized by Minor League Baseball as a 'complete' franchise is a significant honor for everyone involved in our organization," Smokies president, Doug Kirchhofer, said. "As an original member of the modern day Southern League since 1964, the stability the Tennessee Smokies have achieved with strong ownership and several staff members who have been with them for more than 10 years has enabled them to foster and nurture the kinds of relationships necessary for long-term success that all of our Minor League Baseball clubs strive to achieve," Pat O'Conner, president of Minor League Baseball, said. "The Smokies have firmly immersed themselves into the fabric of the Knoxville/Sevierville region through their involvement with many civic organizations and hosting of numerous community events throughout the year. They are truly worthy of becoming the first Southern League club to win our highest honor, the John H. Johnson President's Award." The Larry MacPhail Award, symbolizing the top promotion effort in Minor League Baseball, has been awarded annually since 1966. The Storm once again garnered local and national attention this season, despite being located in the challenging Los Angeles market. Their Charlie Sheen-co De Mayo promotion, which contained a bobblehead giveaway and the retiring of the No. 99 jersey from Sheen's role in the movie "Major League," among other elements, was featured by national media outlets. The club also revamped its social media campaign for 2011, streamlining its several groups and companies to one location. Every weekday home game featured a special promotion, and on Sundays kids got to perform various game operations duties, including PA announcing and running the scoreboard and video boards. The Storm has several mascots and characters that entertain fans throughout the game, including Thunder, the Rally Cop, the Rabbit Jackpot, who celebrates every Lake Elsinore homer, and the Groundscrew Gorilla, who captured Minor League Baseball's Golden Bobblehead Award this season for best in-game promotion. Lake Elsinore, the first California League club to win the MacPhail Award, stresses the importance of reading, staying in school and being environmentally smart to more than 60,000 kids through its reading program. Participants who read "Thunder's 8 Tips to Going Green" book and nine others receive a ticket to a Storm game. Thunder and some of the staff also act out the book and go over the tips of going green during a 20-minute presentation. The Storm's regular season attendance of 225,769 led the California League for the second straight year. "We appreciate the recognition and feel pride in the accomplishment on being named this year's MacPhail Award winner," said Storm president, Dave Oster and vice president and general manager, Chris Jones. "We understand there are many creative and talented organizations in Minor League Baseball, so this is a reflection of the hard work the Storm staff put in this season," stated Jones. "Every year we strive to run an awesome operation in Lake Elsinore," added Oster. "This is why the Storm organization is way stoked to have won this award." "The Lake Elsinore Storm has been successful with its think outside-of-the-box approach to garner attention and attract fans, given their location in the Los Angeles market, for quite some time," O'Conner said. "A testament to their efforts is the fact that the Storm logo has been one of the most popular ones in Minor League Baseball for a while. "As one of the first Minor League Baseball clubs to 'Go Green' at its ballpark, Lake Elsinore has promoted a sustainable lifestyle to its fans and community, making them a deserving recipient of the 2011 Larry MacPhail Award."